A change in diet can cause diarrhea in some cats. Unlike goats, cats can't just eat indiscriminately without paying for it. There are plenty of foods, some even included in commercial cat foods, that can give your kitty diarrhea. Helping your cat avoid these foods can make his stomach feel better. Your cat might love milk, but his stomach probably doesn't. Most cats are lactose intolerant and shouldn't have milk, cream, cheese or ice cream. One exception is low-fat plain yogurt in small amounts, which can actually help settle kitty's upset stomach. Resist the temptation to offer your cat a bowl of milk, especially if he's already not feeling well, since it causes diarrhea in most cats. Some cats are born with food allergies and some develop them later in life, but either way, foods that his body won't tolerate can cause bowel problems. For most cats, these foods are ones that wouldn't normally be part of a feline's diet, such as corn, wheat, soy and eggs. A food elimination diet can help determine if your cat has a food allergy. Ask your veterinarian for guidelines before eliminating foods to make sure your cat gets all the nutrition he needs. 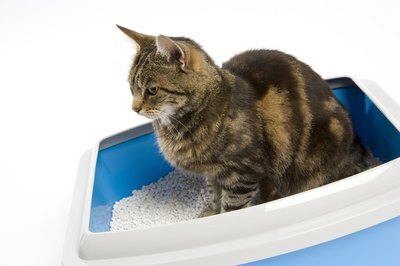 It may not be what your cat is eating that gives him diarrhea, but the fact that it has changed. Some cats can tolerate abrupt diet changes, while others have trouble digesting new foods. The best bet is to make changes to your cat's diet slowly. When switching brands or types of food, mix a little bit of the new into the old, gradually increasing the amount of new food each day until the switch is complete. Some cat foods are so full of fillers that they are better at upsetting your cat's stomach than nourishing him. Look for foods that have meat, not meat by-products or vegetables, as the main ingredient. Cats must have meat in order to stay healthy, and foods with too little meat and too much corn, wheat or unidentified animal by-products can cause diarrhea. Cats seem to think the best treats are in the garbage. Unfortunately, overindulging, eating spoiled food or items not intended for cats can cause severe digestive upset. Your cat may seem like he can handle just about any type of food, but his stomach can become very irritated by too much sugar, fat or rotten food. What Foods Are Good for Cats That Have Problems With Digestion?